This week at Just Add Ink is the challenge using the beautiful inspiration picture by Nikki. This just yells summer to me with gorgeous yellows, greens & whites! I don’t have anything so daisy like, but I love the Secret Garden stamp set and coordinating framelits. Initially I stamped the flowers in daffodil delight, but it didn’t have enough interest, so I used the technique called Kissing. 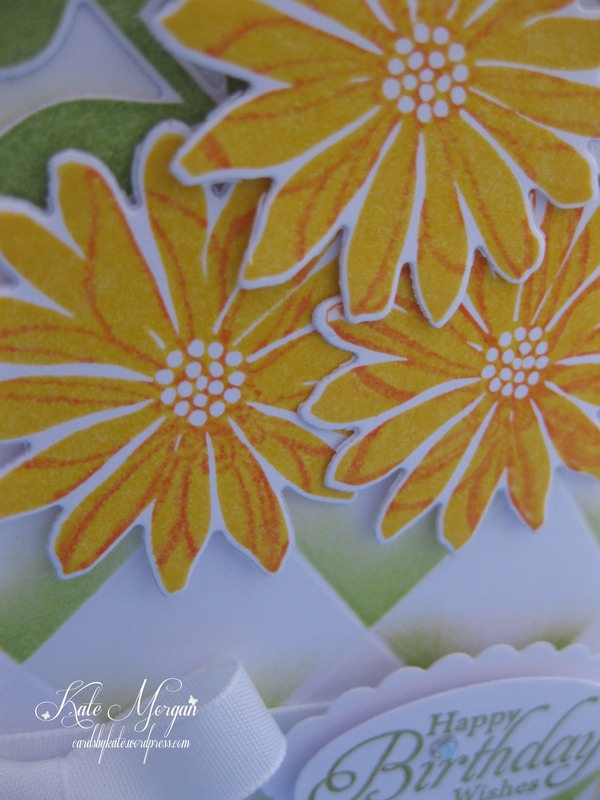 To do this, you ink up the flower stamp with the Daffodil Delight ink, then ink up another stamp with Tangerine Tango ink. 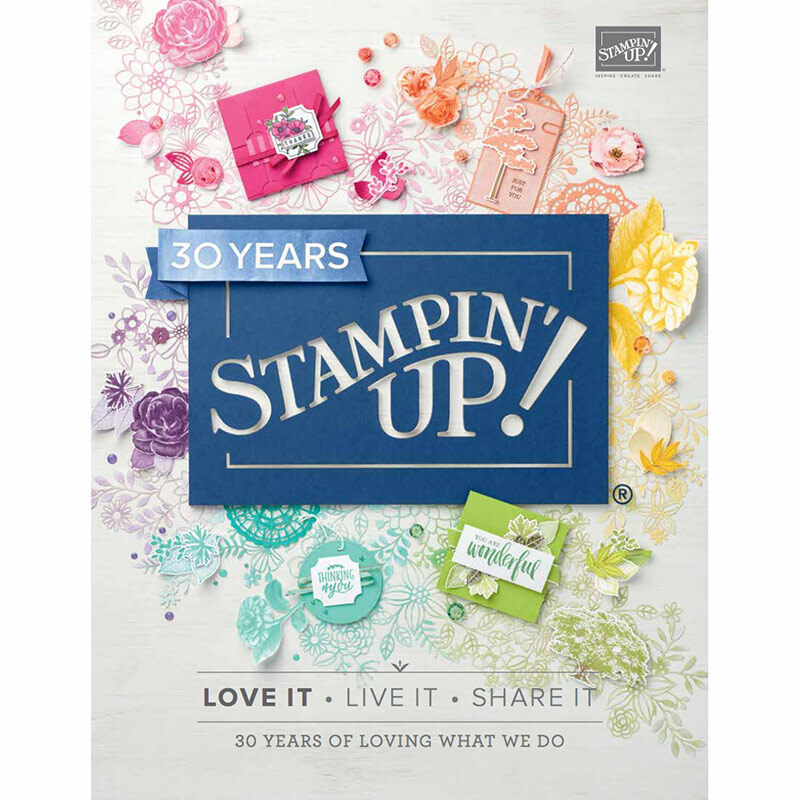 Press (KISS) the 2 stamps together before stamping the flower onto the white cardstock. Don’t you agree it gives more interest? Are you wondering how I created the background? I thought you may. I used the Simply Scored Tool and scored the crosshatch pattern. Then did the same on another scrap piece of card and cut part of it away to create a diamond template (see below). 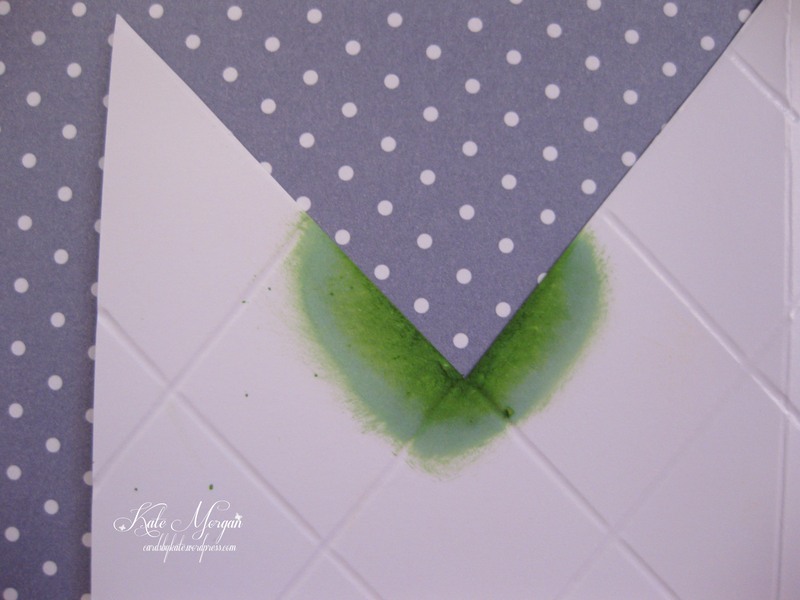 Line the template up on your cardstock and using a sponge dauber, sponge the ink in the bottom of each diamond! I love this summery style although I am not so good in the heat. Is anyone else suffering with these days over 30 degrees? I like to hibernate and stay inside with the cooler on…. maybe it’s just my excuse to stay home and stamp!!! Why don’t you have a go and some of the weekly challenges too on the Just Add Ink page! 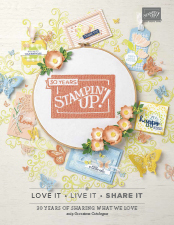 Tagged Birthday, Feminine, Handmade, JAI, Secret Garden, Simply Sketched, Stampin' Up! What a fab Lattice effect and the way you created it is great ..Very clever! I agree with you on the flowers, they have so much more depth with that technique. Lovely take on the inspiration Kate and thanks for sharing your creative tips and joining us at Just Add Ink too! too. You’ve created such pretty dimension to your flowers with the kissing technique and I LOVE your background lattice effect! Thanks for joining us at Just Add Ink this week! Wow I love your use of both of techniques on this card! Such a lovely entry in our challenge at JAI this week. Kate this is such a lovely card! The kissing adds fabulous detail to your flowers and so that your nifty shading. Thanks for joining us at Just Add Ink. 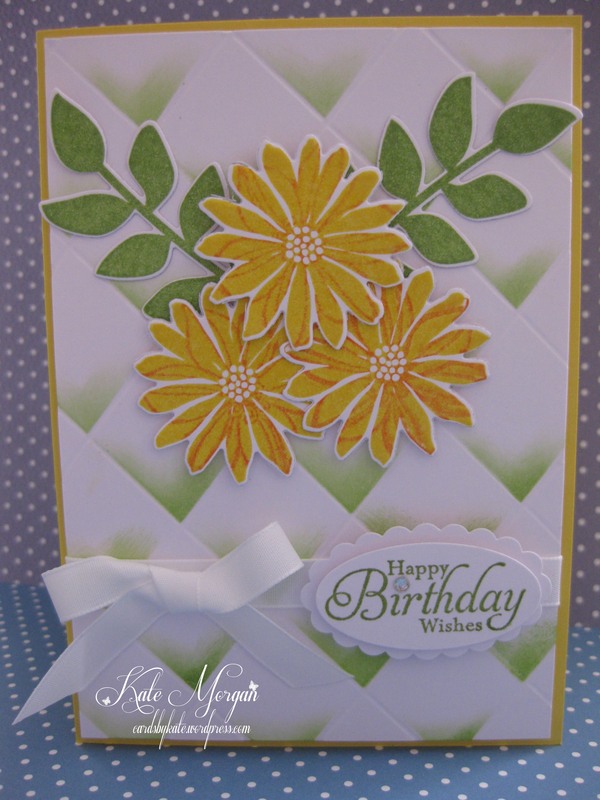 This is a gorgeous card – and thanks for showing me how to get that effect for the background! The kissed flowers are lovely, as is your card. Thanks for playing at Just Add Ink this week.